Oscar Pistorius's lawyer Barry Roux, SC, showed great interest in the High Court in Pretoria on Friday in where former police officer Hilton Botha was during the first tour of the scene of Reeva Steenkamp's murder. "Where was Mr Botha?" 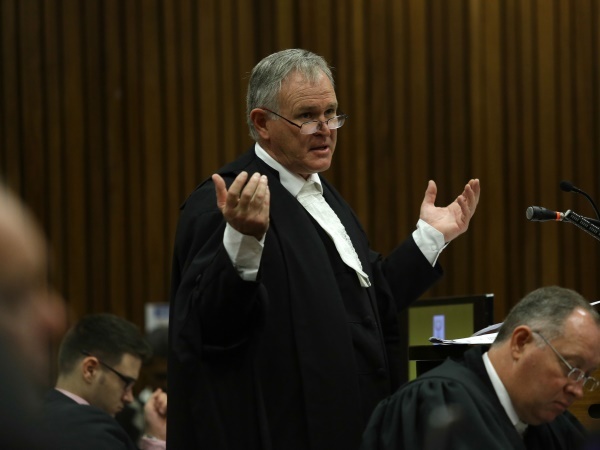 was a refrain Roux repeated as he cross-examined the first police officer on the scene, Colonel Giliam van Rensburg, during Pistorius's murder trial. Van Rensburg was asked how he and Botha walked through the house where Pistorius shot dead his girlfriend Steenkamp on February 14 last year, a few hours after the alleged crime. Van Rensburg said he did not know where Botha was, and did not see him touch or move anything. Botha was the first investigating officer assigned to the case. It later emerged that he mishandled evidence. He subsequently resigned from the police and was replaced by Lt-Gen Vineshkumar Moonoo. Pistorius claims someone broke into his house. He shot through the locked toilet door thinking the intruder was behind it, killing Steenkamp. Court adjourned for tea shortly after 11am. Pistorius is accused of the premeditated murder of model and law graduate Steenkamp. He is also charged contraventions under the Firearms Control Act. He has denied guilt on all charges.